A real-world example of where using PowerShell “-Verbose” parameter is more efficient than a Google search. Couldn't connect to the source mailbox. Why couldn’t it connect to the source mailbox? My IT Pro lizard brain kicked in and I automatically Google’d the error message. A search on “Couldn’t connect to the source mailbox.” (in quotes) returned just over a thousand results. The first six were lengthy threads on the TechNet forums, with a lot of back and forth messages trying to troubleshoot someone else’s issue. The first result was talking about Cisco Load Balancers and a Client Access Array, and I can tell you I felt like I was way off mark in my search. Now, (SPOILER ALERT) I will tell you that further down there were results that ultimately described the same problem I had encountered. However, I only realized that after I resolved my problem and started writing this post. All cmdlets have -Verbose as a standard parameter. A cmdlet author uses Write-Verbose to write messages to the verbose message stream. This stream is used to write information about command processing, useful for debugging the command. Mileage will vary depending on the what the cmdlet does as well as the verbose messaging included by the cmdlet author. MapiExceptionProtocolDisabled: Unable to make connection to the server. VERBOSE: [13:05:39.956 GMT] New-MailboxExportRequest : Runspace context: Executing user: tpslabs.net/Users/LabAdmin, Executing user organization: , Current organization: , RBAC-enabled: Enabled. VERBOSE: [13:05:39.987 GMT] New-MailboxExportRequest : Searching objects "LargeMailBoxes" of type "MailboxDatabase"
Exchange1.tpslabs.net failed with error: Downlevel clients aren't supported. VERBOSE: [13:05:40.798 GMT] New-MailboxExportRequest : Admin Audit Log: Entered Handler:OnComplete. 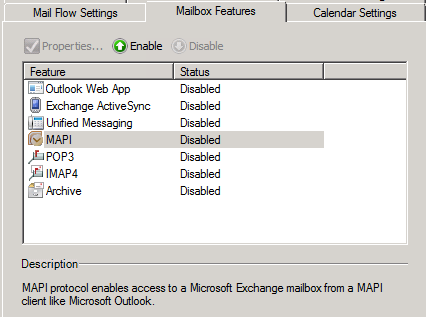 Sure enough, if I go and look at the mailbox properties, I see that MAPI had been disabled. I re-enabled MAPI for the mailbox and re-ran my original export attempt (no -Verbose parameter). It now ran successfully and queued the export. 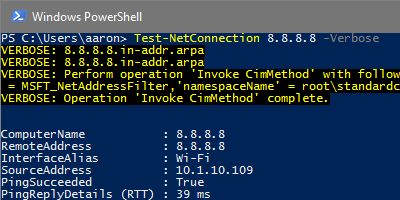 The next time you run into a PowerShell cmdlet error, resist the temptation to Google a vague error message and re-run the cmdlet with the -Verbose parameter instead. When writing your own functions or cmdlets, use Write-Verbose to add verbose messages to aid troubleshooting.